One day after an anti-war/anti-ROTC demonstration that led to the suspensions of students, clubs, and campus publications, student activists assembled again, only this time to protest their treatment at (and the consequences of) the prior day's demonstration. Many of the student grievances are expressed in this flier which calls for a strike in effort to "force the administration to reinstitute suspended and expelled students" from the May 29, 1933 protest. That protest, which took place during an ROTC review on campus, escalated with the arrival of police officers who had been called in by CCNY President Frederick B. Robinson. By protest's end, several left-leaning student organizations and publications would be shut down, and Robinson would be accused of attacking students with his umbrella. Leftist activism was particularly active on CCNY's campus during this period with the college's ROTC program just one target of protest. 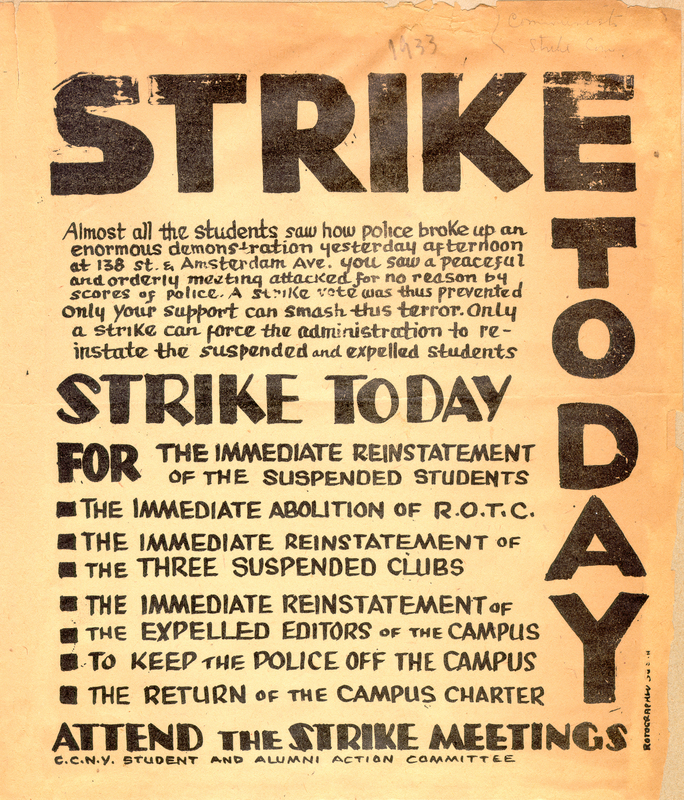 Cite This document | CCNY Student and Alumni Action Committee, “"Strike Today," 1933,” CUNY Digital History Archive, accessed April 25, 2019, http://cdha.cuny.edu/items/show/4042.